We'll start with the basics. What is a differential, how does it work, and why do we need one in a vehicle. We'll start with why we need one. In any vehicle, the engine connects to the transmission and the transmission connects to one or two differentials. The differential connects to two drive wheels (front or rear, it does the same job either way). When the vehicle is driving down a straight road, the two drive wheels should be spinning at the same speed. But when the vehicle starts going around a corner, the two tires take a different path. The inside tire takes a much shorter path than the outside tire. Because of this, the two tires need to be traveling at a different speed. The inside tire needs to slow down and the outside tire needs to speed up. This difference of wheel speed is allowed by the differential. So how does it work? If you open up an axle housing with a standard differential, you'll see where the input gear (called the pinion gear) comes in. You will see that it engages with a ring gear that is attached to a big chunk of metal with a bunch of parts inside of it. This big chunk is called a carrier and the parts inside are what make up the differential. If you take the weight off the wheels and spin the pinion, you'll see that the entire case rotates as the pinion gear spins the ring gear. You'll see that the tires spin at the same speed as the differential carrier. Now, put one of the tires on the ground and spin the pinion. You'll see that the carrier still spins at the same speed as before but the one tire spins twice as fast as the carrier. You will also see the gears inside the carrier spining, allowing one axle to spin at a different speed than the other. This is the differential in action. You can experiment by holding light pressure on one tire, watching as it slows down while the other tire speeds up. So what's wrong with an open differential? Well, as the above example suggests, if you lift one tire up off the ground (or get it in some slippery mud or on some ice) it is free to spin. All of the energy the engine makes is spent spinning that free tire. The other tire, the one that has traction, doesn't budge. So when you're in a low traction situation, you're going to have a hard time getting out of it. If you are in a 4WD vehicle with low traction on one of the front tires and one of the rear tires, you're still going to be stuck. So how do we solve this problem? Turns out there are several methods to send power to the wheel that has traction. They each have their strengths and their weaknesses. I'm not going to make any recommendations because every person has different goals and budget limitations and there is no one single solution that is good for every situation. The first and most common traction aiding device is the limited slip differential. As the name suggests, it's a differential that limits the "slip" of the tire with no traction. There are several ways to do this. By far the most common is the clutch style. Inside the differential, there are a number of clutch plates compressed into one or two packs. They use alternating plates with keys that engage in either the carrier or with the spider gear inside the case. They are fairly tightly compressed so that the spider gear won't spin without a lot of force. Other limited slip differentials use a complex set of gears that resist spinning. There are several other types out there but they are not in common use in anything besides OEM applications. There are even computer driven differentials that have started coming on the market in the last several years. If you're going around a corner on dry pavement with a limited slip differential, you will still get the differential action. But when you're in a low traction situation, some of the energy will be directed to the wheel with traction. If you lightly press on the brakes, you'll get a little more resistance on the spinning wheel and that will help direct more energy to the wheel that isn't spinning. On the more advanced differentails, the computer will use the ABS sensor to detect wheel spin and automatically engage the brake on that one wheel and/or activate something inside the differential to keep it from free spinning. These advanced systems are getting pretty good at keeping you going on the road in all weather conditions. Cost Of all the traction aiding devices, they typically cost a lot less than other options. Only the open differential and the spool costs less. Streetability These systems behave very consistently and predictably on the street. Low Drivetrain Stress There is virtually no added load on the drivetrain to cause premature wear on components. Effectiveness As their name implies, they only limit slip. If you get a tire in the air, they might help a little but you're still probably going to lose traction and get stuck. While better than nothing, they're little use on anything harder than a mild off road trail. Durability The clutch plates, especially in OEM spec differentials, don't last. They wear out quickly the more you use them. They will wear to the point that your limited slip will act just like an open differential. For the serious off road enthusiast who wants to tackle the tough trails, you need a system that will positively lock the two sides together so that the tire with traction will spin no matter how little traction the other tire has. If you want a differential that still works on pavement but you want to lock your axles together, the entry level option is the automatic locker. The basic concept of all automatic lockers is the same. They are spring loaded devices that automatically lock and unlock depending on the driving conditions. When you're coasting and start to go around a corner on pavement, the tires will naturally want to change speed. That force will go down the axle shaft into the locker. When it gets strong enough, the locker springs will allow the internal parts of the locker to ratchet. It's not as smooth as a differential but it does allow the tires to travel at different speeds. The tighter the corner, the more the locker will ratchet. You'll hear it (and maybe even feel it) pop when it does this. When you accelerate, the internal parts of the locker will be forced together tighter, completely locking the differential so that the axle shafts cannot spin at different speeds no matter what. So when you're off road and you hit the gas to get over an obstacle, the tire with the traction is guaranteed to spin, helping you get where you want to go. There are two main types of automatic lockers. The first is the "drop in" or "lunch box" locker. 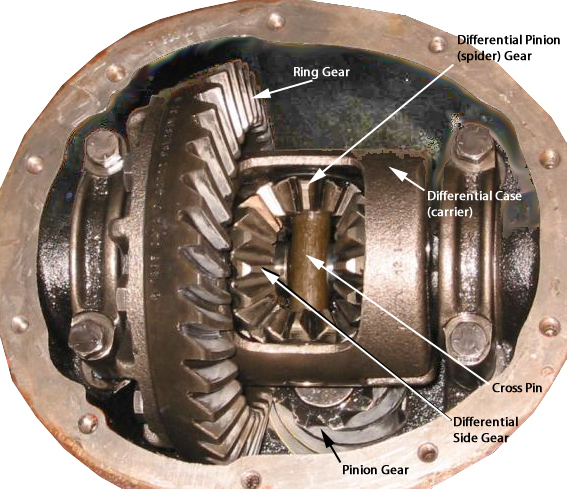 It is designed to replace the gears inside of a regular open differential. Everything is contained within the carrier. The second type is the full carrier locker. These lockers replace the entire carrier and are usually much stronger than the lunch box lockers. They do the same thing but when the case is replaced, you can build the replacement with much bigger and stronger parts that wouldn't be easy to fit into an open differential carrier. In a few cases though, the OEM designed the differential carrier to come apart so you can drop the stronger full case automatic locker inside it without buying a whole new case. For example, the GM full float 14 bolt axle with the 10.5" ring gear and the Rockwell 2.5 ton axle. Cost For a locker that allows wheel spin on the pavement, there is nothing cheaper than a lunch box locker. The full case lockers are easily 3-5 times as expensive as lunch box lockers but still cheaper than other locker alternatives. Simplicity You just install the locker and go. There's no cables, air hoses, wires, or anything to deal with. You don't have to remember if you left it off or on. Traction When you're on the gas, this locker will make both tires spin no matter what (or until something lets go). The tire with traction will always turn. Lock steer While some automatic lockers are more pronounced than others, there is a tendency for the vehicle to make drastic (but predictable) changes in direction when you get on the throttle or let off. It's not uncommon to hear about people who will suddenly find themselves one lane over after a throttle adjustment when driving down the highway. Since it's predictable it's possible to get used to it but it is something you have to get used to if it's significant enough. Low traction issues on road The problem with automatic lockers is that they lock whether you want them to or not. On wet/icy/snowy roads, there may not be enough force to unlock the locker when going around a corner. As a result one (or both) of the tires can slide, causing unpredictable handling. This is much more pronounced on the front axle unless you have locking hubs that are unlocked. Like lock steer, these issues can be overcome by adjusting driving style and knowing how to predict the different behavior. Premature wear The shock loading of locking and unlocking is hard on everything. It's hard on tires, wheels, axle shafts, universal joints, drive shafts, transfer cases, transmissions and even engines. Though the torque converter in the automatic transmissions tend to soften the shock to the engine. Using automatic lockers just means that you need to keep after regular maintenance better and maybe rebuild/replace parts more often than you would otherwise. As their name suggest, selectable lockers allow the driver to select when it is locked and when it is open. Every selectable locker the author is aware of is a full case locker. There are three basic methods for activating a selectable locker: Air pressure, shift cable, or electricity. The air locker uses valves in air lines to optionally supply compressed air into the locker to force the locker to engage. A cable actuated locker uses a shift cable much like a bicycle shifter to slide an engagement collar back and forth. An electrical locker is one that uses an electromagnet to engage the locking mechanism. All of these are controlled by switches or small shifters inside the cabin where the driver can easily get at them. When the selectable locker is disengaged, it operates like an open differential or, in at least one case, like a limited slip differential. When operated on paved roads, they behave as if there was no locker in them. Once the locker is engaged, the behavior changes. The locker completely locks the two axles together so that they always spin together. It doesn't matter if you're accelerating or coasting, the axles are locked together and the tires will spin at the same speed. Selectability This benefit should be obvious. You can choose when to lock the axle and when to leave it open. This gives you the behavior you want when you want it. Traction Like the automatic locker, the selectable locker (when locked) will guarantee that both tires on an axle will spin so the tire with traction can move you where you want to go. Wear Since you can operate the selectable locker open, it does not add unneeded wear to components. There is no constant locking/unlocking shock. Cost These lockers are by far the most expensive. They are hundreds of dollars more than a full case automatic locker. And, in the case of the air locker, require an auxiliary compressed air source which will set you back a hundred dollars or (probably) more. Complexity Selectable lockers require that you run a cable, or a wire, or set up a whole compressed air system to run them. You have to figure out where you want to put all your switches and everything else. You have to run the controls to the axle and make sure they don't get torn off by anything. Installation and maintenance are both more complex. The simplest traction aiding device is the spool. It is not a differential at all. It never allows the axle shafts to spin at different speeds. Ever. Well, until something breaks. There are two types of spools. The mini spool is a lot like a lunch box locker. It is a few pieces that are swapped in place of the spider gears inside of an open differential. But the mini spool has no springs and no way for the pieces to ratchet. They are fixed in place and do not move. The full spool is made from one solid piece of metal and entirely replaces the carrier. It is typically thinner than a carrier but because it is a solid piece it is usually far stronger. An alternative to the spool is to weld the differential. Sometimes called a lincoln locker (named after the Lincoln brand welders), it is a fairly straightforward process. Once you have the differential open and cleaned out of all the oils (including letting any cleaning solvents evaporate), you simply weld the spider gears inside the carrier to each other and the carrier itself. Don't weld the ring gear or the carrier bearings. Just do the inside of the carrier. Assuming you do a good job welding, the lincoln locker is as strong as a full spool and works just as well. Cost This is a very inexpensive way to get traction off road. The full spool is the most expensive but it's still cheaper than a new open differential carrier. The mini spool is cheaper. Welding is the cheapest. Traction You never have to worry about your tires not spinning until something breaks. Predictability The full spool is much more predictable than an automatic locker. On road traction Since the tires will never spin at different speeds you'll always be spinning a tire when you go around a corner. Slick road traction Since you're slipping one tire around every corner you will lose traction easier on a corner than you would with a functioning differential. Premature wear on road The locked condition causes excessive tire wear on road. You also have more stress on axle shafts than you would with a differential. This wear is not as much as you get from the shock load of an automatic locker but it is not inconsequential. The constant slipping of tires on road causes excessive tire wear. Reduced turning radius If you weld the front differential and can't or don't unlock your front hubs you'll lose a lot of turning radius on and off road.